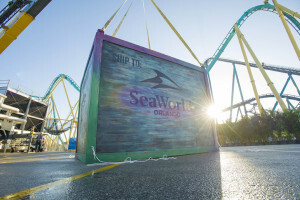 This week, SeaWorld Orlando unveiled the custom-built Mako lead car that will take riders on a thrilling experience this summer – the tallest, fastest and longest roller coaster in Orlando. Mako’s design and engineering was inspired by the real Mako shark – one of the ocean’s fastest shark species. When it opens, Mako will top 200 feet high and reach speeds of 73 mph on a track that’s nearly a mile long. The new ride will be a hypercoaster, which means it’s all about speed, tight turns and that weightless feeling riders get at the top of each hill. 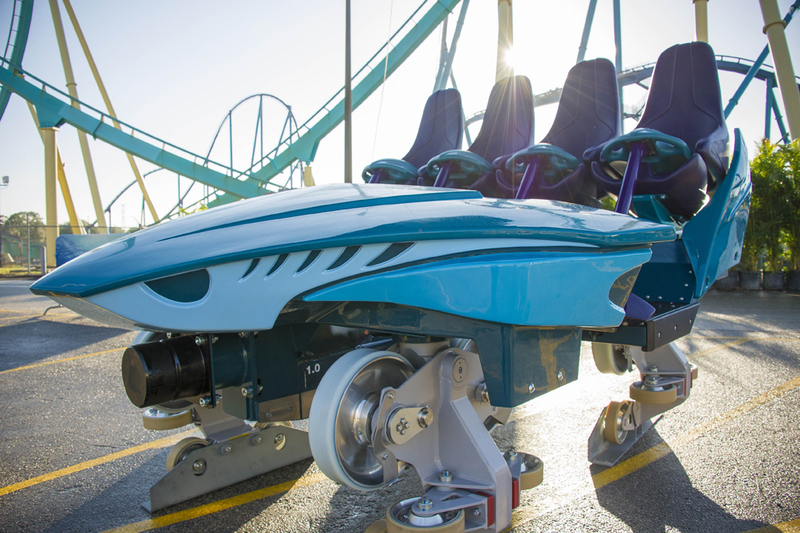 Mako-Inspired Custom Car – In a collaboration between SeaWorld’s animal experts and ride engineers, the car is inspired by the physiology of an actual Mako shark, including five gills on each side, eye placement and sleek, hydro-dynamic look. Fast Wheels – Comprised of a special compound that reduces friction — providing a smooth, relentlessly fast ride from beginning to end. Upper Body Mobility – With only a lap guard on their lower body, riders’ upper bodies are free for added mobility and airtime. The coaster will boast a total of 21 cars – including 3 trains of 7 cars per train. For more Mako information, visit SeaWorldOrlando.com and join the conversation using #NothingFaster. This entry was posted in Home Page, Home Page Slider, News and tagged Bolliger & Mabillard, Mako, SeaWorld Orlando. Bookmark the permalink.